The certification mark pescadeRías ¿de onde se non? is an identity mark which promotes and defends fish and shellfish from the small-scale fleet whose quality and diversity go beyond our borders. The origins of pescadeRías: This mark come up in the Consellería do Mar (Regional Office of Maritime Affairs) from the Xunta de Galicia (Galician Regional Government) in 2008, with the aim of distinguishing clearly those products that come from the small-scale fleet within the wide offer that the present globalized market has and with its wide range of products. Advantages for the consumer: When having a distinguishing sign in fishing products, we can tell the difference easily in the market that we see every day. These labelled products are a guarantee of freshness and quality for you. In addition, they are environmentally friendly and undergo appropriate hygienic and handling processes in the companies that place them in the market. 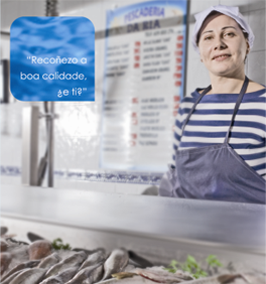 Advantages for the companies: The mark is a tool offered to the fishing sector in order to distinguish the freshness and quality of the product in the current competitive market, and also to be able to advertise the way in which it was carried out, which is the best support for the continuity and the future of the activity.